Self-proclaimed victims of global warming or those who "expect to suffer" from it - from beachfront property owners to asthmatics - for the first time would be able to sue the federal government or private businesses over greenhouse gas emissions under a little-noticed provision slipped into the House climate bill. Environmentalists say the measure was narrowly crafted to give citizens the unusual standing to sue the U.S. government as a way to force action on curbing emissions. But the U.S. Chamber of Commerce sees a new cottage industry for lawyers. The bill was written by House Energy and Commerce Committee Chairman Henry A. Waxman, California Democrat, and Rep. Edward J. Markey, Massachusetts Democrat. 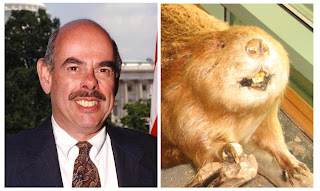 Henry Waxman and ...... lost twin brother?